This past Friday, I was in Philadelphia for the day on a work trip. It was very interesting, although incredibly tiring, particularly as I’m not used to waking up at 5:30 in the morning. However, after a venti latte and a smooth, 2-hour train ride, 14 of my colleagues and I arrived in the “City of Brotherly Love” for a jammed packed day, full of talking with Mayor Michael Nutter and his staff, discussing the city’s innovative approaches to workforce training with resident experts, and visiting the city’s training and resource centers. Our hosts kept us all very busy, to the point where we were literally running to catch our 6pm train home. By the time we arrived back at DC’s Union Station around 8pm, we were exhausted, although I think we all thought it was a worthwhile trip. Once off Amtrak, I said good-bye to my coworkers, hopped on Metro, and headed home, stopping only to get the regular, Friday night pizza. I walked in the door, ready to eat dinner and crawl into bed, but there was no way I could miss ending such a great day with a nice glass of wine, so, as Hubby grabbed plates, I popped the cork on bottle of Chianti. The 2007 Ruffino Chianti Superior (winery, snooth) was 75% Sangiovese and 25% Canaiolo Nero, Cabernet Sauvignon, and Merlot grapes. The wine had a deep ruby color, with a hint of garnet on the rim. On the nose, there were cherries, strawberries, cloves, smoke, and vanilla, followed by a hint of rose petals and cedar. In the mouth, there were ripe cherries, red plums, smoke, cedar, and a hint of vanilla. The Chianti had high acidity and low-to-medium tannins. Is this worth a glass after work? Sure…you won’t be drinking anything out of the ordinary, but you’ll definitely have a decent, reliable glass of wine. At $13, this wine was a nice accompaniment with my pizza and a good way to shake off the travel dust as I relaxed into the evening. However, for $2 more, you can buy the 2007 Ruffino Aziano Chianti Classico, which was a bit more complex and gorgeous when paired with traditional Italian dishes. 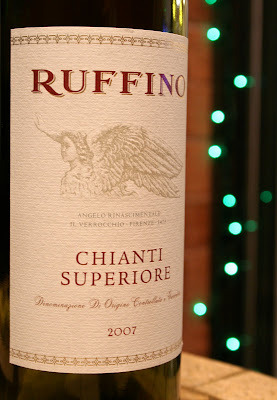 So, if you have a bottle of the Superior, definitely open it up and enjoy it, but if you’re heading out to buy a Ruffino Chianti, it’s worth the few extra bucks to buy the 2007 Ruffino Aziano Classico. Thanks, Shelby! They looked good in person too, but being that it's the beginning of February, we REALLY need to take them down.